Christmas are closing and it’s time to start thinking about your gift choices. Tech gadgets would be the perfect match for your tech-freak friends. 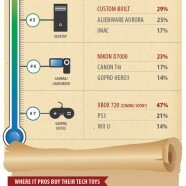 If you are seeking advice for the right choice, 800 IT pros speak about their wants and dos for this holliday.